Today, the industry uses dozens of non-ferrous metals. They differ from each other in physical properties, processability, area of application. The most common non-ferrous metals: copper, aluminum and lead, which are the basis for the majority of non-ferrous alloys. Non-ferrous metals are the best conductors. And not only. Their advantages are numerous — corrosion resistance, durability, flexibility, strength, wear resistance. Different types of non-ferrous metals are used in different areas, but more often — in metallurgy, construction, aviation, mechanical engineering. It is one of the oldest metals. Many years ago, copper became a basis for the manufacture of weapons and objects of labor. This element is commonly found in nature. 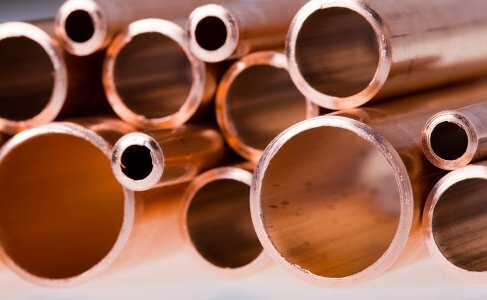 Pure copper has a pink-red, highly conductive electrical current and heat is different from other non-ferrous metals of its malleability and softness at the same time, resistant to corrosion. The most common alloys of copper — a bronze and brass. Bronze is composed of copper and tin, sometimes — doped zinc. Due tin increases elasticity and strength of the alloy, the melting temperature decreases. Bronze can be easily forged, easily melted, form filling almost completely, leaving empty pores, due to which decreases the likelihood of cracking products. The composition includes only brass, copper and zinc. This alloy is very well treated in pressurized hot or cold. If the zinc content is less than 15% — an alloy begins to corrode, especially when stored in a moist environment, rich in sulfur, or ammonia. It contains aluminum, magnesium and copper. The highest content of aluminum alloy, so this is also called duralumin alloy. To increase the strength of duralumin heated to 500 ° C, and then placed in cold water. After hardening a metal is widely used in the aircraft industry for the production of the fuselage, rudders, fairings, and m. P.
He is the second non-ferrous metals on the electrical conductivity of copper after. A distinctive feature of this metal is easy. Its surface is covered with an oxide film. Due to this, aluminum is almost not subject to corrosion, as a consequence, and received the most widespread. It has a high density. It is four times heavier than aluminum. This lead melts easily. He also has one important feature — a very volatile at high temperatures. This metal — exceptionally soft, easily scratched with a fingernail. Compound formed by lead and tin. This alloy is characterized by a high rate of wear resistance with a very low coefficient of friction. Because of these properties, equipment, manufactured using babbitt — more durable and reliable in use. This iron alloys with other metals or nonmetals. The composition of these alloys can be varied, depending on the application. For example, ferronioby, ferromolybdenum, ferrotitanium used for alloying heat-resistant alloys and tool steels. Often ferroalloy price lower than the metal in pure form, as ferroalloy usually obtained directly from ores. In stock «Electrovek-steel» company offers a wide range of non-ferrous metal standard and custom settings. Our offices are located in Russia and Ukraine. Making a purchase is possible, without leaving the office, for example, on the internet through the Company’s website. To purchase just need to place your order and click «buy». Today easily buy a non-ferrous metal as scrap and waste. If necessary, on any current problems you can consult our managers. Lead times are minimal. When wholesale purchases include preferential discounts.